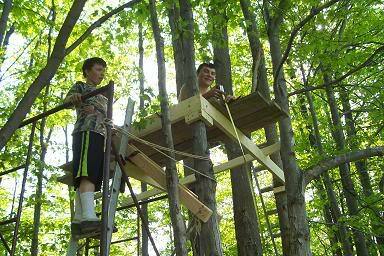 I think I first fell in love with trees as a 12 year-old boy when I built my first tree house. It wasn’t much to behold, more like a place to perch in the tree than a tree house really. But I loved to climb up that tree and sit there looking out at the world from above. The massive strength of the big branches of that old elm tree just seemed to wrap around me. I felt safe up there… despite the danger of falling and breaking my arm. 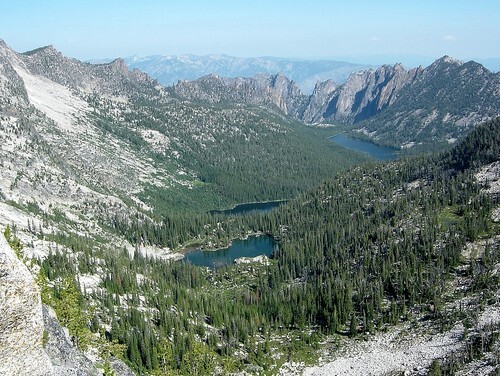 Then, a year or two later I went on a 50 mile hike with my Boy Scout troop in the Big Horn Crags area of what is now the Frank Church River of No Return Wilderness in central Idaho. Now I had fallen in love not just with trees, but with the whole forest. The forest not only provided shade for tired hikers, but also for the huckleberries that grew along the trail, which we promptly picked and made huckleberry pancakes. I can still smell that huckleberry pancake batter like it was yesterday. When I entered college I took courses on plant identification, including trees. Having grown up working in my Dad’s nursery I knew the names of most trees so it was an easy “A”, but I did learn about some trees that I didn’t know much about, like the ancient Ginkgo tree- a living remnant of fossils that date back as much as 270 million years. 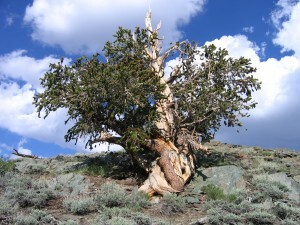 I also learned of the Bristlecone Pine- the oldest living tree on the planet, with at least one living specimen in the high arid mountains of the west estimated to be over 5,000 years old. In making horticulture my vocation when I left college, my love for trees has only grown. I’ve been buying, selling, planting, growing, and observing trees for over 40 years now. No matter where I go, I can’t help but notice the trees. I’m fascinated by their bark, their roots, their trunks, their branches, and their leaves or needles. (Did you know that fir needles are flat, spruce needles are square in cross section, and pine needles come in clusters of two to five which if held together are circular in cross section?) Trees have even been a part of most vacations we’ve taken as a family. On a fishing trip to Uclulet, British Columbia we visited the amazing old growth Douglas Fir, Sitka Spruce, Western Red Cedar, and Western Hemlock forests on Vancouver Island. We’ve traveled through Oregon and visited the huge fir near the Oregon Coast, as well as the Redwood forests of northern California. I’ve admired the huge ancient oaks of Texas, the incredible fall colors of New England, and the swaying palm trees of Hawaii. 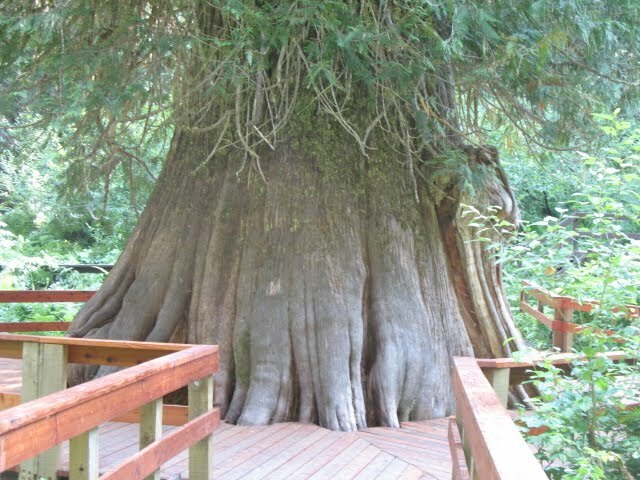 Here in Idaho I’ve marveled at the giant Western Red Cedar near the small town of Elk River in central Idaho. It is said to be the largest tree in North America east of the Cascade -Sierra Crest. There is a trail to the tree and a wheelchair accessible viewing deck. This giant is 18 feet in diameter at breast height, 177 feet tall, and is estimated to be about 3000 years old. For context, a 500-year-old tree was alive when Spanish explorer Ponce de Leon landed on the Florida Coast. A tree in the 1,000-year-old range began life around the time Norse explorer Leif Ericson is believed to have visited North America. A tree more than 3,000 years old, as the giant cedar near Elk River is purported to be, was alive when David flung a rock from his slingshot and killed the giant Goliath. A tree that is 5,000 years old was already 500 years old when the Great Pyramid of Giza was built. 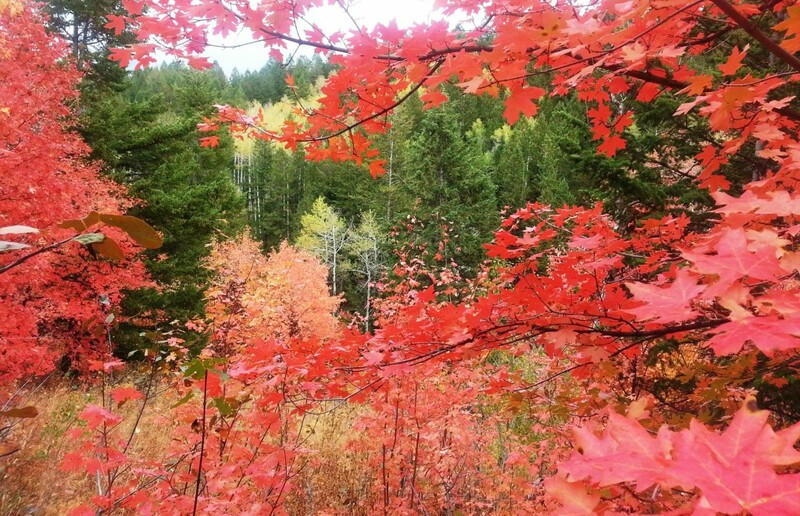 Closer to home we always like to take a drive to the Palisades reservoir each fall and enjoy the spectacular scarlet and golds of the native maples and aspens surrounded by the deep green of pine and fir forests. Even closer to home I enjoy the trees of Tautphaus Park and the many other city parks in our area. And closest to home, I enjoy sitting in the shade of the honeylocust, maple, and oak trees in my back yard… with a good book and cool drink in hand. Trees are fascinating in and of themselves, but their true value lies in how they improve our quality of life. Trees are not just a pretty feature in your backyard. They improve the quality of our air by filtering pollution, and absorbing and storing carbon. In addition they provide privacy, reduce noise, and provide protection from cold wind and hot sun, which saves us money by decreasing our energy use; not to mention how they provide shelter and homes for birds and wildlife, cooling shade for us humans, and of course a place to build tree houses. We are lucky to live in an area where our communities understand the importance of trees. Pocatello, Blackfoot, Idaho Falls, and Rexburg have all achieved the Tree City USA designation by The Arbor Day Foundation. To qualify as a Tree City USA community, a town or city must meet four standards established by the Arbor Day Foundation and the National Association of State Foresters. 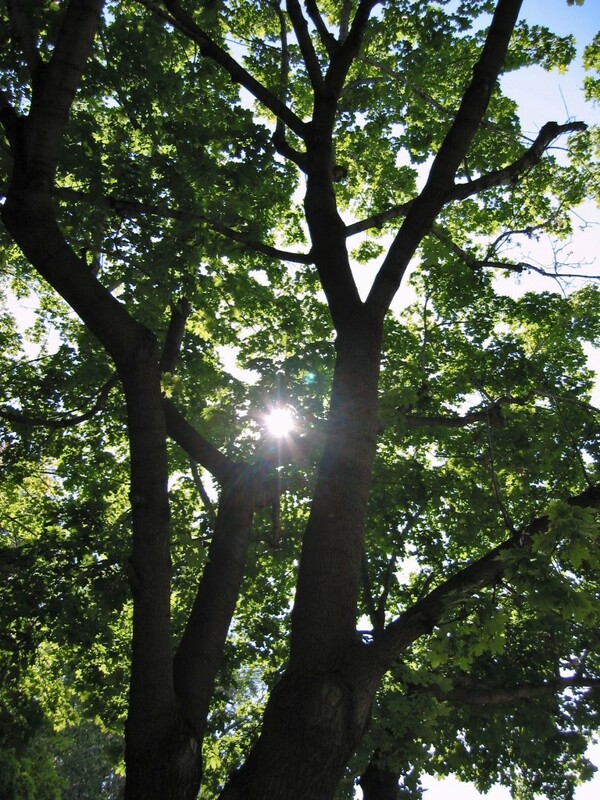 These standards were established to ensure that every qualifying community would have an effective tree management program for the urban forest. Neighborhoods with trees are inviting and welcoming… and houses in those neighborhoods tend to sell quicker and for higher prices than those without trees. You can make a difference in our urban forest. They say the best time to plant a tree is 10 years ago, and the second best time is today. Plant a tree today. You’re really just planting smiles.